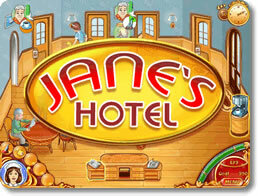 Jane's Hotel Game - Download and Play Free Version! Help Jane build a beautiful hotel! Help Jane make her dream come true! 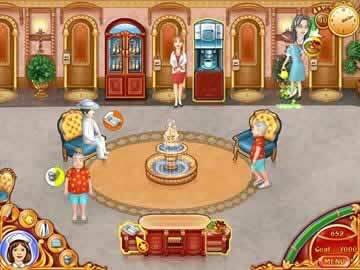 Help her build and manage a beautiful hotel and win the Best Hotel Of The Town contest! 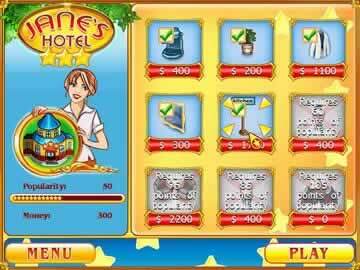 You begin with a small two star hotel at the outskirts of Jane's native town. By carrying out customers' wishes attentively, you earn money and achieve a better reputation. Don't forget to have an eye on your customers' mood, for your goal is to make them want to return to your hotel again and again. Get a peek at the gameplay awaiting you in this hotel management game. See the various actions you'll have to take care of to keep your customers happy, such as getting them their room keys, grabbing them a cup of coffee, or providing them with a bottle of wine.